The following report was released by the House Homeland Security Committee in September 2015. Today we are witnessing the largest global convergence of jihadists in history, as individuals from more than 100 countries have migrated to the conflict zone in Syria and Iraq since 2011. Some initially flew to the region to join opposition groups seeking to oust Syrian dictator Bashar al-Assad, but most are now joining the Islamic State of Iraq and Syria (ISIS), inspired to become a part of the group’s “caliphate” and to expand its repressive society. Over 25,000 foreign fighters have traveled to the battlefield to enlist with Islamist terrorist groups, including at least 4,500 Westerners. More than 250 individuals from the United States have also joined or attempted to fight with extremists in the conflict zone. These fighters pose a serious threat to the United States and its allies. Armed with combat experience and extremist connections, many of them are only a plane-flight away from our shores. Even if they do not return home to plot attacks, foreign fighters have taken the lead in recruiting a new generation of terrorists and are seeking to radicalize Westerners online to spread terror back home. 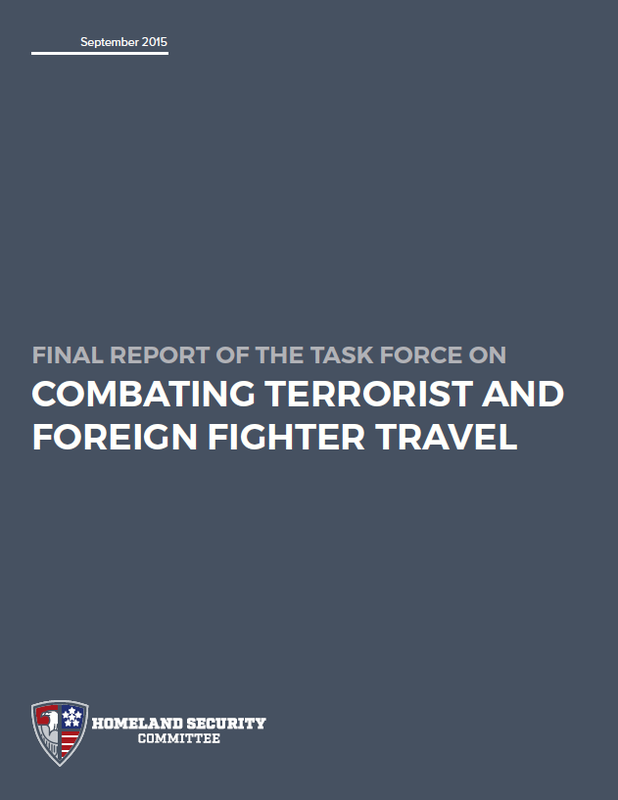 Responding to the growing threat, the House Homeland Security Committee established the Task Force on Combating Terrorist and Foreign Fighter Travel in March 2015. Chairman Michael McCaul and Ranking Member Bennie Thompson appointed a bipartisan group of eight lawmakers charged with reviewing the threat to the United States from foreign fighters, examining the government’s preparedness to respond to a surge in terrorist travel, and providing a final report with findings and recommendations to address the challenge. Members and staff also assessed security measures in other countries, as U.S. defenses depend partly on whether foreign governments are able to interdict extremists before they reach our shores. • Despite concerted efforts to stem the flow, we have largely failed to stop Americans from traveling overseas to join jihadists. Of the hundreds of Americans who have sought to travel to the conflict zone in Syria and Iraq, authorities have only interdicted a fraction of them. Several dozen have also managed to make it back into America. • The U.S. government lacks a national strategy for combating terrorist travel and has not produced one in nearly a decade. • The unprecedented speed at which Americans are being radicalized by violent extremists is straining federal law enforcement’s ability to monitor and intercept suspects. • Jihadist recruiters are increasingly using secure websites and apps to communicate with Americans, making it harder for law enforcement to disrupt plots and terrorist travel. 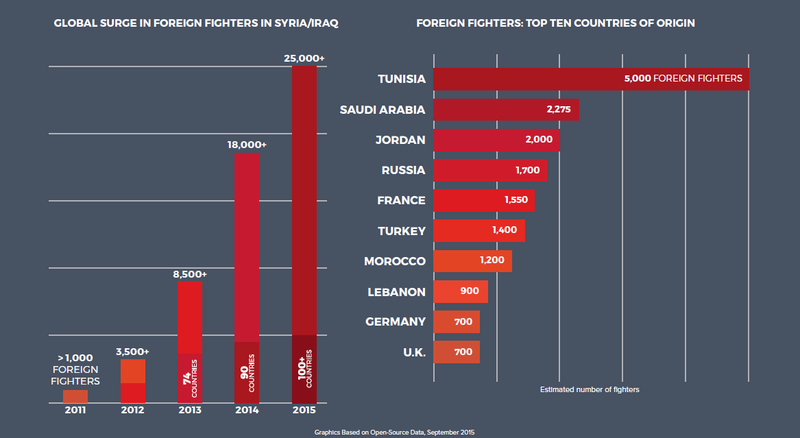 • There is currently no comprehensive global database of foreign fighter names. Instead, countries including the United States rely on a patchwork system for swapping extremist identities, increasing the odds foreign fighters will slip through the cracks. • “Broken travel” and other evasive transit tactics are making it harder to track foreign fighters. • Few initiatives exist nationwide to raise awareness about foreign-fighter recruitment and to assist communities with spotting warning signs. • The federal government has failed to develop clear early-intervention strategies—or “off-ramps” to radicalization—to prevent suspects already on law enforcement’s radar from leaving to fight with extremists. • Gaping security weaknesses overseas—especially in Europe—are putting the U.S. homeland in danger by making it easier for aspiring foreign fighters to migrate to terrorist hotspots and for jihadists to return to the West. • Despite improvements since 9/11, foreign partners are still sharing information about terrorist suspects in a manner which is ad hoc, intermittent, and often incomplete. • Ultimately, severing today’s foreign-fighter flows depends on eliminating the problem at the source in Syria and Iraq and, in the long run, preventing the emergence of additional terrorist sanctuaries.